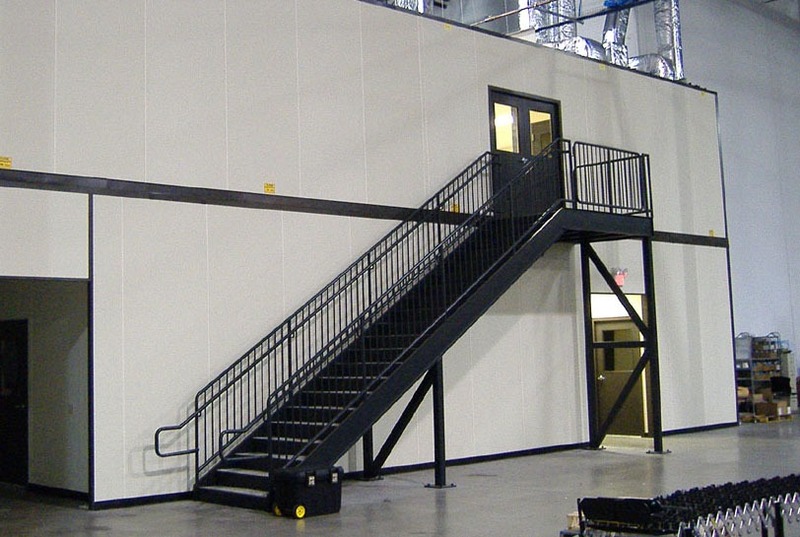 When looking for stair solutions for a commercial or industrial environment, there are typically two options to look at: prefabricated or stick-built. In both cases, the stair system built should be able to satisfy proper building code and can be built/installed using stamped drawings from a licensed architect, if needed. However, both of these options have different qualities that make them more or less applicable to certain facilities. 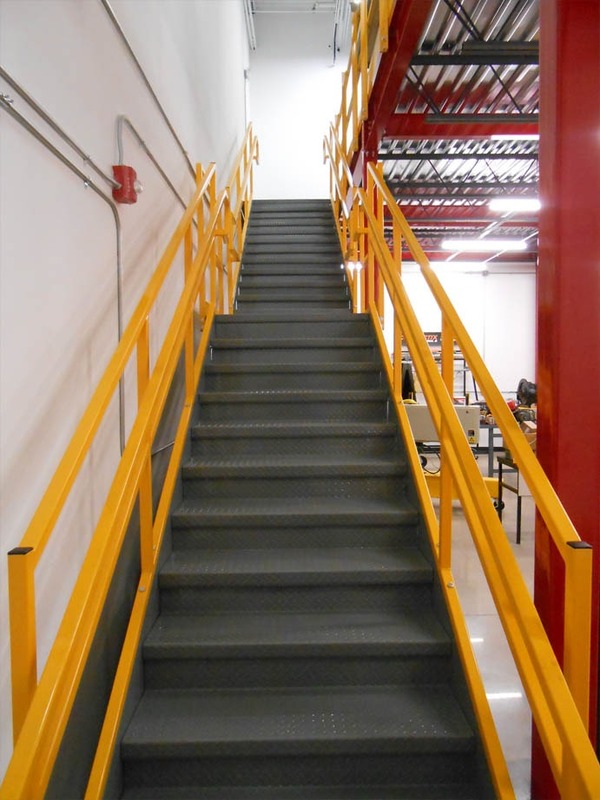 For our metal stair systems, all components are fully engineered, fabricated, and powder coated in-house, leaving only the installation left to complete the project. Using our bolt-together system, our metal stairs can be installed in your facility in a much quicker manner than traditional stair systems. If the prefabricated stairs are going to be installed to an existing structure, the systems in most cases the system can be installed in no time at all. And the heavy equipment needed to install the stair systems is minimal, typically only needing a single forklift to transport materials. When comparing this installation to the on-site fabrication of traditional stair system, this part of the process will take much longer. There will need to be a much bigger working area for the extra materials on site and the machinery used to make the custom cuts into the materials. And of course, with these custom, on-site material cuts come the additional waste and inevitable clean up that comes along with it. The prefabricated construction process offers a quicker project schedule than site-built in nearly all project categories. Looking at the chart above, you can see that the first two steps in the process are the exact same. Both types start with designing and engineering the structure. This step will ensure the system fits in with the rest of the facility and will be structurally sound. Permits and approvals will make sure the structure passes all building codes and standards. However, the third step in the process is where the prefabricated stair system takes the lead. In the prefab/modular construction process, site development and foundation occur at the same time that the structure is being fabricated in an off-site facility. Next, all the prefabricated stairs needs is to be installed on site. For on-site construction, the builders can only start on the stairs after the site has been fully cleared, and afterward, the site restoration takes much longer, cleaning up wasted materials, moving machinery, and any other site-built by-products. When comparing prefabricated and site-built stairs, both have flexibility in their own ways. For both the stair systems, the structures are still designed to meet customer specifications. However, with the prefabricated stairs bolt-together system, the prefab system can be used as a permanent or semi-permanent structure. This can be a great benefit for a company that is looking to expand further in the future and would need to remodel again. Plus, if a company is renting their facility space, adding permanent structures can oftentimes be against their lease and are strictly prohibited. For the on-site built stairs, there can be a little more leeway in the case of highly custom jobs. In this scenario, the stair system could have odd, changing angles for the pathway, highly customized hand railing/pickets, etc. Typically, these are alterations that increase the aesthetics of a stair system, increasing the form of the stairs rather than the function. A simple and safe stair system that serves its purpose will almost always be preferred. In the prefabricated construction process, there is more control overall from step to step in the process. The factory work environment has been set up and developed to manufacture this exact structure every time, fully streamlined. The fabricators are familiar with their tools, their work environment, their work process, and their fellow employees. This familiarity with the product and workspace allows for minimal errors overall in the work process and an increased quality of the product. A well-experienced prefabricated stair manufacturer will provide more consistently high-quality stair systems. That is not to say that site-built stairs are inherently bad. However, the unfamiliar job site and increased on-site, custom material alterations will create a greater risk of human error. This rise in errors can increase the construction time, increase the project clean-up time, increase project costs, and even create a higher probability of job site injuries. The face value price difference between these two types of stair systems will vary greatly depending on the building standards and contractor pricing in your area. However, when looking at the chart above the overall cost of traditionally built stairs would have to include the longer project time, extra waste, and increased chances of quality errors that may or may not be a problem for the future. For Panel Built, Inc., we offer full quotes on all of our prefabricated stair systems in 24-48 hours, including a sales drawing, and a 3D modeling of your system. With these tools and the other incurred costs mentioned in the paragraphs above, you and your company will be able to make a more informed decision on your next stair project! Get a Prefabricated Stairs Quote Today! 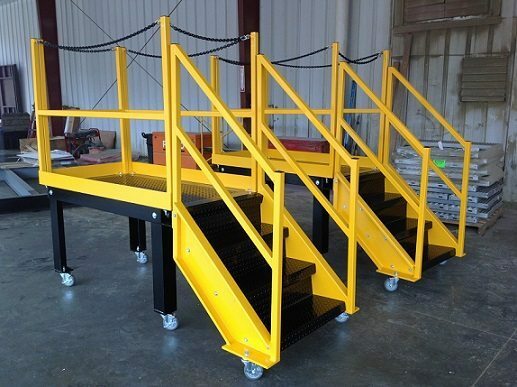 Both stick-built and prefabricated stairs can be fully compliant with OSHA and IBC codes as well as fully stamped engineer drawings. Panel Built, Inc. has completed prefabricated construction projects in all 50 states, Canada, Mexico, and overseas. Take a 3D Tour of One of our Stair Systems!